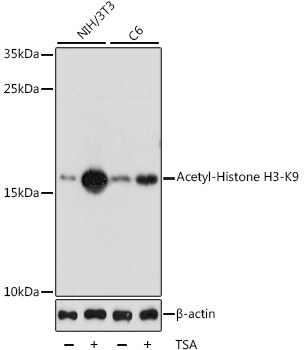 High sensitivity of Histone H3K9ac (Acetyl H3K9) Monoclonal Antibody [4E9B11] in detecting histone H3 acetylated at K9. High specificity of Histone H3K9ac (Acetyl H3K9) Monoclonal Antibody [4E9B11] in detecting histone H3 acetylated at K9. Earn up to 179 reward points for this purchase! Histone H3- along with H2A, H2B and H4- is involved in the structure of chromatin in eukaryotic cells. Histone H3 can undergo several different types of epigenetic modifications that influence cellular processes. These modifications including acetylation, phosphorylation, methylation, ubiquitination, and ADP-ribosylation occur on the N-terminal tail domains of histone H3, which results in remodeling of the nucleosome structure into an open conformation more accessible to transcription complexes. In most species, histone H3 is primarily acetylated at lysine 9, 14, 18, and 23. Fig. 1. High sensitivity of Histone H3K9ac (Acetyl H3K9) Monoclonal Antibody [4E9B11] in detecting histone H3 acetylated at K9. Fig. 2. High specificity of Histone H3K9ac (Acetyl H3K9) Monoclonal Antibody [4E9B11] in detecting histone H3 acetylated at K9. Danaher RJ et. al. (December 1969). Histone deacetylase inhibitors prevent persistent hypersensitivity in an orofacial neuropathic pain model. Mol Pain. 14:1744806918796763.